Tenth Hurricane Of Season Ties 124-Year Record - Joe.My.God. With Tropical Storm Ophelia’s transition to Hurricane Ophelia on Thursday, 2017 became the first year in more than a century — and only the fourth on record — in which 10 Atlantic storms in a row reached hurricane strength. Franklin. Gert. Harvey. Irma. Jose. Katia. Lee. Maria. Nate. Ophelia. 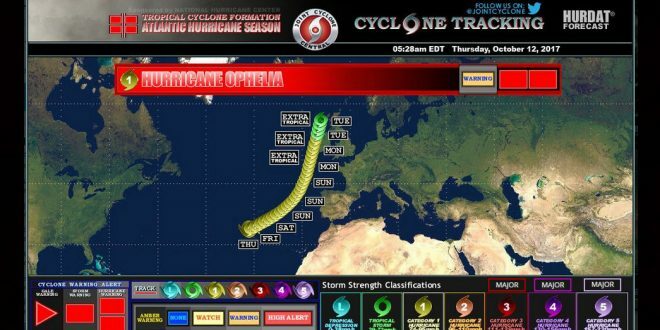 Ophelia, far out in the Atlantic, does not pose a threat to the United States, though it may affect Ireland. But it puts this year in the history books by at least one measure. The last time 10 consecutive Atlantic storms became hurricanes was in 1893 — and because tracking technology was far more primitive then, meteorologists say, some weak tropical storms or tropical depressions may have gone undetected within that streak. Hurricane Ophelia is crossing the Atlantic Ocean and could bring wet weather and gusts of up to 70mph when it hits Britain’s shores. The tropical storm was named a hurricane overnight and the US National Hurricane Centre has warned it could strengthen over the coming days. The west of the country will see the worst of the weather, with winds of between 60mph and 70mph forecast. It will coincide with the 30th anniversary of the Great Storm of 1987, which hit southern England overnight on October 15. The storm caused damage estimated at £1 billion and claimed 18 lives. Met Office forecaster Alex Burkhill said: “Ophelia became a hurricane overnight and the forecast track takes it eastwards towards Iberia for the weekend.